"This event is a beauty pageant for the natural-plus-size, which we must embrace and appreciate. We want the beauty queens to express themselves; so appreciate their intellect and clear the impression that a beauty queen must be size zero," she said. "Brazil has a carnival, are they selling their women? Tourists go to see the Karimojong, the Masai, and the Batwa; are they up for sale? Curvaceous women are eye-catching people unless they are saying we restrict beauty pageants to only slim ladies," she said. 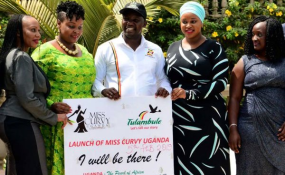 Ms Mungoma said if a Ugandan participant wins the Miss Curvy World contest, this would help promote the country's image and get the world to know Uganda more. "All the way from West Nile down to South Uganda, we have naturally endowed women and we need to tell the story about the cultures where these women come from and that is how we shall market our country," she said. She added that besides marketing our natural attractions, this would also promote cultural endowments. While addressing journalists after the Presidential Investors' Round table discussions on Thursday, Mr Museveni said, the proposal has never been endorsed by Cabinet, adding that there is no justification for tourists to come to Uganda to purposely look at beautiful women.